Wiley, 2006-11-27. 1. Paperback. Used:Good. 2006-10-30. Good. Ships with Tracking Number! INTERNATIONAL WORLDWIDE Shipping available. May not contain Access Codes or Supplements. May be ex-library. Shipping & Handling by region. Buy with confidence, excellent customer service! Prospero Books. Hardcover. 1552671550 New Condition. . New. 2001-01-03. Good. Ships with Tracking Number! INTERNATIONAL WORLDWIDE Shipping available. May not contain Access Codes or Supplements. May be ex-library. Shipping & Handling by region. Buy with confidence, excellent customer service! Prospero Books. Hardcover. 1552671550 Like New Condition. . Fine. Toronto: Prospero Books, 2001. 244 pp. Gray boards decorated in red on the spine; headband. Very light rubbing on the corners of the dustjacket; no interior markings. The Chapters are: Murder; More Murder; The Witness; Bloody Tipperary; Green Wounds; Death's Shadow at the Door; The Blooding of Farrell; The Reproach of the Counties; The Fugitive; Entr-acte; Uneasy Peace; Mistaken Identity; Maggie Thompson; The Failure of Lochinvar; Assualt and Arson; The Vigilantes; Poor Jimmy Howe; Reign of Terror-Fire; Strychnine for Breakfast; I'll Tell Ye of a Plot...; Politics, Beaks, and Bobbies; Enter Father Connolly; Boney over the Alps; A Deacent Man; The Last Night; A Night's Work; Ashes to Ashes; Suspects and Blackfeet; The Trials; Thirty Pieces of Silver; and The End of It All.. Second Printing. Hardcover. Very Good+/Very Good+. 8vo. General Publishing Company, Limited, 1995-01-01. Paperback. Good. Etobicoke, ON, Canada: Prospero Books, 2001. Reprint Edition . Hardcover. Fine/Fine. 8vo - over 7¾" - 9¾" tall. Fine gray cloth. Fine white pictorial DJ. (2001), 8vo, , 244pp. Fee & Cawker p. 77 Canadian Fiction An Annotated Bibliography. "This is a tale of the 'Black Donnellys,' a notorious family of Irish settlers who were brutally massacred in their Lucan, Ontario, farmhouse on February 4, 1880." Etobicoke, ON, Canada: Prospero Books, 2001. Reprint Edition . Hardcover. Good/Good. 8vo - over 7¾" - 9¾" tall. Very good gray cloth. Very good white pictorial DJ. Light wear, usual ex-library markings. (2001), 8vo, , 244pp. Fee & Cawker p. 77 Canadian Fiction An Annotated Bibliography. "This is a tale of the 'Black Donnellys,' a notorious family of Irish settlers who were brutally massacred in their Lucan, Ontario, farmhouse on February 4, 1880." Laurentian Library, 1967. Mass Market Paperback. Acceptable. Disclaimer:A readable copy. All pages are intact, and the cover is intact. Pages can include considerable notes-in pen or highlighter-but the notes cannot obscure the text. At ThriftBooks, our motto is: Read More, Spend Less.Dust jacket quality is not guaranteed. Etobicoke, ON, Canada: Prospero, 2001. Second. Hardcover. Very Good/Very Good. 8vo. pp. 244. Etobicoke, Ontario, Canada: Prospero Books. Very Good+ in Very Good+ dust jacket. 2002. Hard Cover. 244 pp. Spine bumped. Jacket has slight edgewear. 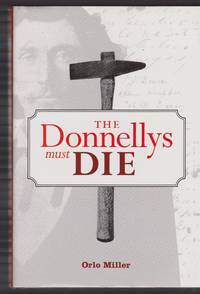 A reprint of the 1962 book by Orlo examining the infamous murders of the Black Donnellys in Lucan, Ontario. ; 8vo - over 7¾" - 9¾" tall . Toronto, Ontario: Prospero Books, 2001. Book. Very Good+. Hardcover. Second Edition. Second printing; minor wear; remainder line on bottom edge; otherwise a solid, clean copy with no marking or underlining; a very good reading copy..
Toronto: Prospero Books, 2001. 244 pp. Gray boards decorated in red on the spine; headband. Light edge and corner wear on the dustjacket; no interior markings. The Contents are: Murder; More Murder; The Witness; Bloody Tipperary; Green Wounds; Death's Shadow at the Door; The Blooding of Farrell; The Reproach of the Counties; The Fugitive; Entr-acte; Uneasy Peace; Mistaken Identity; Maggie Thompson; The Failure of Lochinvar; Assualt and Arson; The Vigilantes; Poor Jimmy Howe; Reign of Terror-Fire; Strychnine for Breakfast; I'll Tell Ye of a Plot...; Politics, Beaks, and Bobbies; Enter Father Connolly; Boney over the Alps; A Deacent Man; The Last Night; A Night's Work; Ashes to Ashes; Suspects and Blackfeet; The Trials; Thirty Pieces of Silver; and The End of It All.. Second Printing. Hardcover. Very Good/Very Good. 8vo. Canada: Laurentian Library , 1967. Minor edgewear and spine crease otherwise a fine clean tight and bright copy. Mass Market Paperback. Good. Wiley & Sons, Incorporated, John, 2006. Paperback. Very Good. Disclaimer:A copy that has been read, but remains in excellent condition. Pages are intact and are not marred by notes or highlighting, but may contain a neat previous owner name. The spine remains undamaged. Prospero Books, 2001. pp.244 clean tight copy . Hard Cover. Fine/Fine. 8vo - over 7¾" - 9¾" tall. Wiley & Sons, Incorporated, John, 2006. Paperback. Acceptable. Disclaimer:A readable copy. All pages are intact, and the cover is intact. Pages can include considerable notes-in pen or highlighter-but the notes cannot obscure the text. At ThriftBooks, our motto is: Read More, Spend Less.Dust jacket quality is not guaranteed. Wiley & Sons, Incorporated, John, 2006. Paperback. Good. Disclaimer:A copy that has been read, but remains in clean condition. All pages are intact, and the cover is intact. The spine may show signs of wear. Pages can include limited notes and highlighting, and the copy can include previous owner inscriptions. At ThriftBooks, our motto is: Read More, Spend Less.Dust jacket quality is not guaranteed. Toronto: Macmillan of Canada, 1962. First Edition . Hardcover. Good/Good. A Good copy in patterned red-and-black paper-covered boards, in a Good dust jacket tape-reinforced on the verso along the edges by a prior owner. Tanning at the outer edges of the text block, sound binding, clean within. Prospero Books. Hardcover. 1552671550 . Very Good. 2001. Toronto: Prospero Books/Indigo, 1962. Grey boards the titles in a red metalic gilt to the spine. There are no marks of any kind. The D.J. shows one small dent midway up the spine which is hard to see.. First Thus. Cloth Hard Cover. Fine in Near Finr D.J.. 8vo - over 7¾" - 9¾" tall. Condition: Fine in Near Finr D.J. Toronto: Prospero Books, 2001. -----The scan you see is the book you get. Grey cloth with red lettering, headband, 244 pages, Like New condition, dust jacket is in Like New condition. "Here, in the definitive account of this sordid episode in Canadian history, author Orlo Miller attempts to separate fact from fiction & legend from reality to bring us the truth behind the Donnelly murders in Lucan, Ontario, on February 4, 1880." Check out the scans. . Second Printing. Hard Cover. Near Fine/Near Fine. Illus. by Front cover photo of "William Donnelly"; back cover photo of "Donnelly Gravestone". 8vo - over 7¾" - 9¾". Toronto: Prospero Books 1st Printing , 2001 ----------hardcover, with dust jacket. The story of what are perhaps Canada's most popular murders. The book, in gray boards with shiny red lettering and design to the spine, is as new. The unclipped dust jacket (no price to clip) has a modest bump to one corner, and is fine. . .. Hard Cover. As New/Fine. Note: our prices on Biblio are the LOWEST of any of the sites on which we list our books. MacMillan, Toronto., 1967. Soft Cover.. Paperback.. NON SMOKING STORE. My listing INCLUDES PHOTO OF ACTUAL BOOK for sale. More details will be added. Very Good condition. Laurentian Library, 1967. Book. Good. Soft cover. good reading copy. Etobicoke, Ontario, Canada: Prospero Books, 2001. A fine grey hardcover in a fine dust jacket. Copyright 1962, 2nd edition..
Prospero Books, 2001. Slight cover wear otherwise very good. Very clean - may not have been read.. Hard Cover. Very Good/Very Good. CANADA: PROSPERO BOOKS, 2001. RE ISSUE. HARDCOVER. FINE/FINE. Prospero Books, 2001. Hardcover. Very good/Very good. Dustjacket and cover have light wear. Cover has light wear. A couple of words in ink in upper right corner of front endpaper. Stated second printing. Macmillan, 1987. MassMarket Paperback. Good. John Wiley & Sons Canada, Limited, 2006. Trade Paperback. Good. Softcover. Sound & good copy, light to moderate rubbing/edgewear to wraps, thumbing wear. Prospero Books. Used - Good. Shows some signs of wear, and may have some markings on the inside. Prospero Books. Hardcover. 1552671550 In very nice condition. Tightly bound and clean. Free of writing, highlighting, soiling etc. Glossy front and back. Packaged and shipped with care. . Very Good. Etobicoke, ON, Canada: Prospero Books, 2001. This book has no internal or external markings, no rem-mark, and is clean and tight. DJ is not price-clipped, and has no tears, chips or folds, and is bright and clean... Later Printing. Hard Cover. Fine/Fine. 8vo - over 7¾" - 9¾" tall. Book. Macmillan of Canada, 1987. Softcover. VG+.. Reprint of the classic account of the Lucan county murders. MacMillan A good to very good paperback. Pair of small tears to covers. Copyright 1962, 1972 edition..
Toronto, Canada: Laurentian Library 4, 1976. An uncreased spine with very light edge rubbings. No store stamp.. 6th Printing. Trade Paperback. Very Good. Prospero Books, 2001. Hardcover. Good. Disclaimer:A copy that has been read, but remains in clean condition. All pages are intact, and the cover is intact. The spine may show signs of wear. Pages can include limited notes and highlighting, and the copy can include previous owner inscriptions. The dust jacket is missing. At ThriftBooks, our motto is: Read More, Spend Less. Prospero Books, 2001. Hardcover. Good. Disclaimer:A copy that has been read, but remains in clean condition. All pages are intact, and the cover is intact. The spine may show signs of wear. Pages can include limited notes and highlighting, and the copy can include previous owner inscriptions. At ThriftBooks, our motto is: Read More, Spend Less.Dust jacket quality is not guaranteed. Laurention Library, 1972. Please email us if you would like further information or if you would like us to send you a picture of the book. Thanks for looking!. Mass Market Paperback. Very Good. 16mo - over 5¾" - 6¾" tall. Prospero Books, 2001. Hardcover. Very Good/very good. Laurentian Library. Mass Market Paperback. GOOD. Spine creases, wear to binding and pages from reading. May contain limited notes, underlining or highlighting that does affect the text. Possible ex library copy, thatâll have the markings and stickers associated from the library. Accessories such as CD, codes, toys, may not be included. Prospero Books, 2001. Hardcover. Good. Hardcover. Sound, clean & nice copy, light edgewear. Jacket is bright & clean, light to moderate rubbing/edgewear. Not price clipped. May not be available for international shipment due to weight/size. Prospero Books. Hardcover. VERY GOOD. Light rubbing wear to cover, spine and page edges. Very minimal writing or notations in margins not affecting the text. Possible clean ex-library copy, with their stickers and or stamp(s).